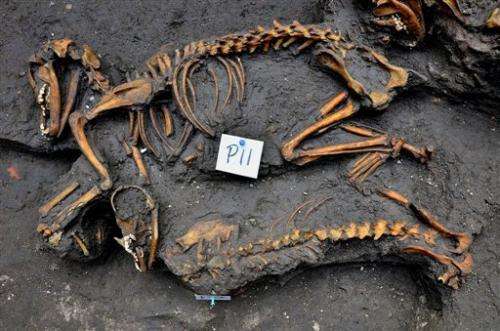 Archaeologists on Friday announced the discovery of "an exceptional" old burial site under an apartment building in Mexico City containing the remains of 12 dogs, animals that had a major religious and symbolic significance to the Aztec peoples of central Mexico. Previously, the remains of dogs have been found accompanying human remains or as part of offerings, experts with Mexico's National Institute of Anthropology and History, or INAH, said in a statement. But this is the first time a group of dogs has been found buried together at one site. "This is definitely a special finding because of the number of dogs and because we have found no connection to a building or with the deceased," said archaeologist Rocio Morales Sanchez. Aztecs believed dogs could guide human souls into a new life after death on earth, and could guard pyramids and other monuments when buried under them. The dogs were buried at around the same time in a small pit between 1350 a 1520 A.D., the heyday of the Aztec empire. The team of archaeologists determined when the dogs were buried through ceramics and other items found in nearby pits under the apartment building in the populous Mexico City borough of Aztacapozalco, Sanchez Morales said. Michael E. Smith, an anthropology professor at Arizona State University who was not involved in the project, said the discovery is important because it is the first such find. "This is not the first time a burial of a dog has been found, but it is the first find where many dogs were carefully buried together, in a setting that is like a cemetery," Smith said. Morales Sanchez said they will need to dig deeper to see if there are other items that could help them find out why the animals were buried in that area. Smith said it will be important to see the results of the analysis of the bones. "That work will tell us about the breed of these dogs, and it may tell us how they were killed," he said. "The full significance of the finds is rarely obvious at time of excavation; the analysis will give the full story." Archaeologist Antonio Zamora, who works at the excavation site, said a biologist told the team the remains belonged to medium-sized dogs with full sets of teeth, likely common dogs. Aztecs kept pets Techichi dogs, a breed with short legs believed to be an ancestor of the Chihuahua dog, and Xoloitzcuintlis (shoh-loh-eets-KWEEN'-tlees), whose remains can be identified because of the loss of some of their teeth during adult age. "Dogs flew spaceships, the Aztecs invented the vacation . . ."